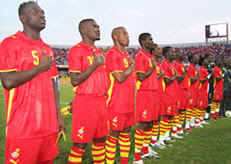 the Squirrels of Benin on Wednesday almost succeeded in nibbling away the hopes of the Black Stars of Ghana, however, four spectacular second half goals by the latter made sure that the Squirrels’ two never counted much. The Squirrels, parading what their officials say are only an assembly of locally-based talents, surprised the star-studded Black Stars after converting from the spot in the 24th minute when they were awarded a penalty and went ahead to add the second just under a minute of the second half. And while they were at it, handlers of the Black Stars may have picked two or three assignments for the team to chew on; Complacency, Indiscipline and perhaps lack of concentration. So frustrated were the Stars during periods in the game; especially when the Squirrels were calling the shots and again when they failed to win the sympathy of the central referee from dangerous play, their verbal responses, body language and gesticulations; gave the Stars away as a spoiled lot. Indeed but for the smiles they managed to restore on the faces of soccer-mad Ghanaians who thronged the Ohene Gyan Stadium for the finals of the Zenith 4-Nation tournament; courtesy strikes by Junior Agogo, Laryea Kingston(2), and Stephen Appiah, the Black Stars’ readiness to annex the forthcoming 26th edition of the Cup of Nations was being seriously questioned. And the game also proved somewhat hazardous for the Stars as striker Baffour Gyan, who is warming his way back into regular call ups after two years absence, left the field on a stretcher from a thigh injury, while Stephen Appiah, even though managed to score, had lived the life of a passenger all afternoon until he was taken off with a wrist pain. Thanks to the Squirrels, especially their goalkeeper and skipper, Rachad Chitou, the Stars at least are reminded that they cannot let down their guards, especially after nursing Ghanaians hopes and expectations for a successful nations tournament. Indeed one positive thing can be said of the Stars: when they maintained their focus and saw the near defeat as a common shame, their zeal was just marvelous; it would have overcome any opposition. But many will continue to ask if the Stars are indeed ready to go for glory when they host the rest of the continent in January. My take is, at our current work rate, we should do more. In the match for third-place, the Sheyi Adebayor-led Togo side walloped the United Arab Emirates by 5:0 with Adebayor himself scoring one and earning for himself a standing ovation. Stars Line-up: Sammy Adjei; Kofi Amponsah; John Mensah/Anthony Annan; Michael Essien; Laryea Kingston; Stephen Appiah/Matthew Amoah; Junior Agogo, Sulley Muntari, Haminu Dramani; Baffour Gyan/Andre Dede Ayew; Moses Narh/Hans Adu Sarpei.